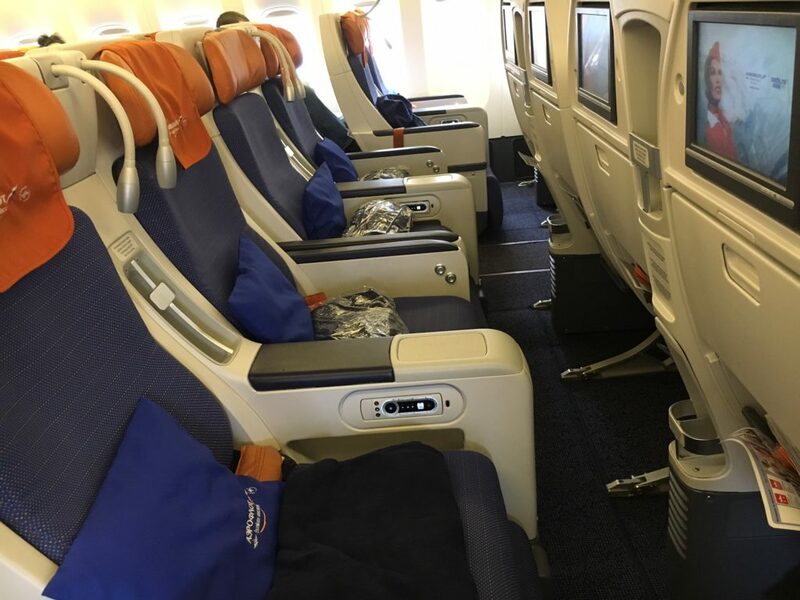 This is a quick and dirty trip report, which specifically aims to address the lack of reviews for Aeroflot’s Comfort cabin class. When my wife and I were deciding on the best airline option from LA to Moscow, we settled on Aeroflot’s non-stop service which, after Transaero’s bankruptcy, remains the sole non-stop to Russia from the US West Coast. The price point for Economy was around $650 and Comfort Class was only about $150 more expensive. Note that these were one way tickets, as our return flight would be on BA/AA via London and Boston (we intended to spend a few days in each). In the spring and summer months, SU operates a three-class Boeing 777-200 on the LAX-Moscow route, while in the winter they switch to a two-class A330. We arrived at LAX a few hours ahead of departure. There is no information on SU’s website about a dedicated check in lane for Comfort Class passengers, but there actually is one. We skipped a pretty big line of Y pax and checked in swiftly. SU allows two bags of 23kg each per Comfort passenger. We also inquired about upgrades to Business and were told that those are available for a mere 17k Aeroflot Bonus points. While we had enough for one upgrade, we didn’t have enough for both of us, so we passed on the offer. Note that cash upgrades are only available on A Comfort fares, and I do not know how much they cost. SU boarding is generally a mess, and when we approached the gate, we saw a long line snaking around and to the back. Assuming that Comfort pax get priority boarding, we approached the front of the line and were allowed to board with J passengers. Once again, not sure if this was our bravado coupled with SU’s lack of care or an official boarding procedure. Comfort Class is its own separate cabin that has a 2-4-2 setup. Each seat is in an individual cradle, with adjustable reading lights, big tables and nicer screens. The seats do not recline but instead slide down. Each seat is equipped with an adjustable leg rest while the seat in front also has a flip-down foot rest. There are several slots both in the arm of the seat (or rather the wall) and near the TVs to store additional items. Some of these slots are more useful than others. 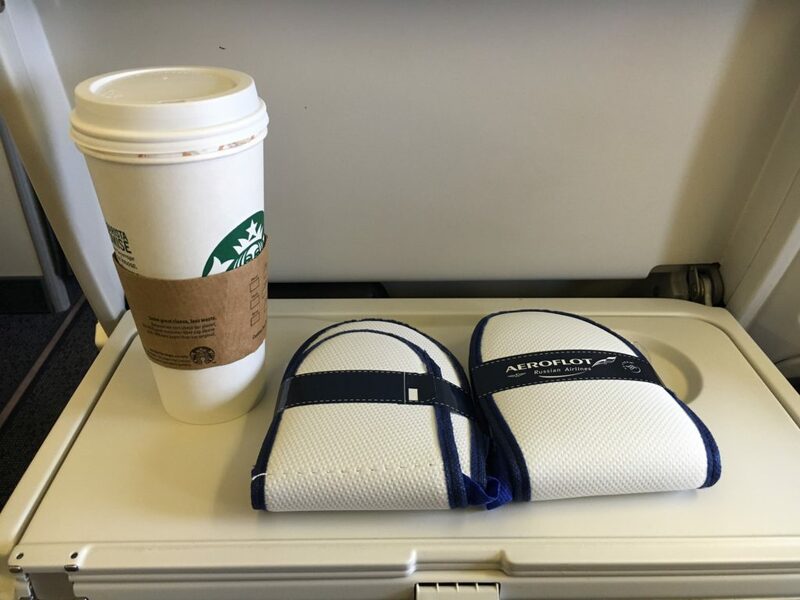 What SU/Boeing intend to be a water bottle holder does not hold the bigger bottles that people tend to bring on board a 12 hour flight, rendering this use of space useless. SU also provides its Comfort passengers with a pseudo amenity kit with slippers and eye mask. A warm blanket and relatively big pillows are also presented. Departure was delayed by about 45 minutes as LAX police investigated something on board. Eventually, they escorted a gentleman in a suit with a roll-aboard suitcase off the flight and we were allowed to push off. 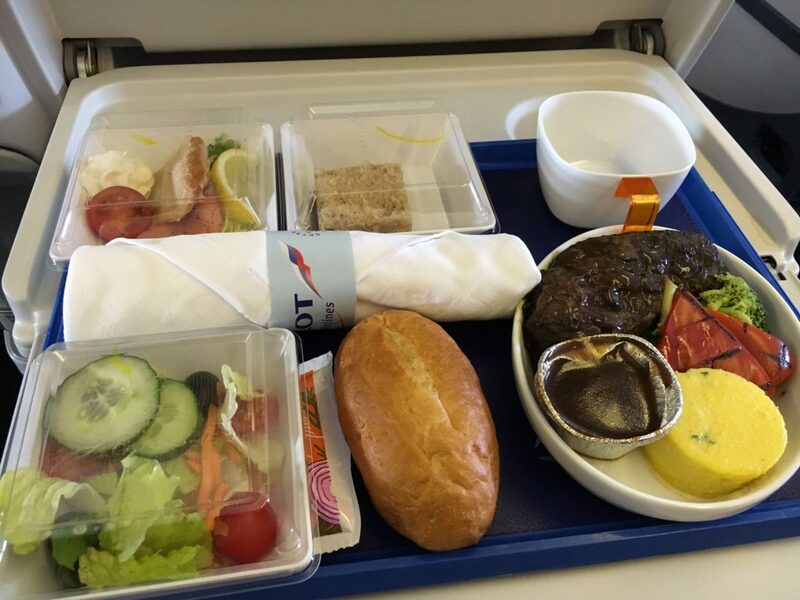 After takeoff, dinner service was fairly swift and the menu items featured entrees from Business class. I had steak, which was great. Salads and other food items were less inspiring. Wine was mediocre (served from a carton) and hard booze was not on offer. One thing that everyone knocks Aeroflot for is the service, which comes from an outdated Soviet-era stereotype. The airline clearly puts a lot of stock in this criticism and has been doing a lot of work to make its soft product world class. The flight attendants on the flight were nothing short of phenomenal, in terms of the quality of service provided and friendliness. I was fighting a bout of flu right before our departure, and one thing that helps me is to drink a lot of herbal tea. Flight attendants were super attentive and made me tea about 15 times on this flight. They also took the time to chat with me and checked in constantly on other passengers. From a hard product standpoint, I would say that the seat is not very comfortable. The sliding approach is inferior to a reclining seat, as it takes away from leg room. The leg rest does not go up sufficiently enough for a tall person to full make use of and the foot rest only helps for so long. 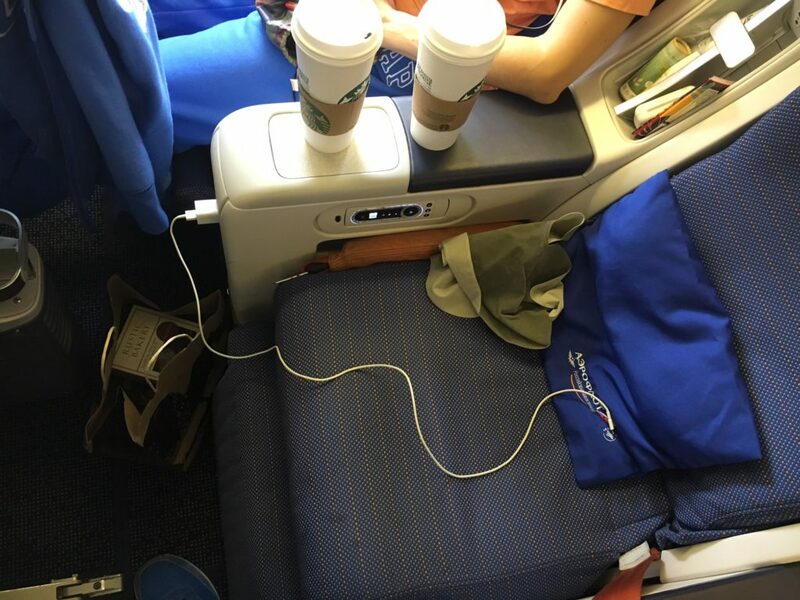 I think for an 8-9 hour flight, Comfort is a good product (JFK-SVO, for example), but on ultra long flights, like the one we took, it is actually less than comfortable. AVOD on SU, while good from a technology standpoint, is lacking in content. If you are a Russian speaker, you will have more to entertain yourself with, but for non Russian speakers, you will find a fairly limited selection of movies and shows. Overall, I was impressed with Aeroflot’s improvements in the on-board service department. I was also fairly happy with their premium economy offering, but it’s not adequate for flights over 10 hours, at least for tall people. In fact, I would say that on a low yield flight, it’s better to fly in regular Y, so that you can flip up the arm rests and stretch out across several seats. Of course, this is a gamble and not worth it if you really want a bit more guaranteed space. The opportunity to upgrade for only 17,000 miles to J is a huge bonus, but I doubt many pax who originate from LA have an account with Aeroflot Bonus, so it may be a moot point.